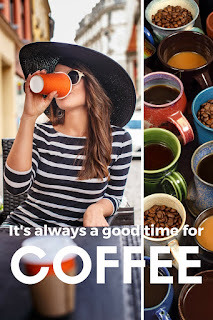 I don’t know about you, but I simply cannot start my day without my morning cup of coffee. Recently my trusty coffee maker up and died. Kaput. No warning. Dead. Now, normally I’d head out to buy a replacement right away, but I had an early client scheduled so I had to leave the house without my usual wake-up cup. Not a good morning. Actually not a good morning for a lot of reasons. In fact, it started with my lack of caffeine and it went downhill like a runaway freight train from there. I had to deal with a high-energy Irish Setter, a high-strung dog owner, and a call from my stinker of an ex-husband. All without caffeine. Now as a pet therapist, the pet/pet owner problems were right up my alley, but the call from my ex… Let's just say if I’d know it was Geoff, I sure as shootin’ would not have answered the phone. I understand not everyone is a coffee drinker. Point in case, my cousin, Melinda, isn’t a fan. She's all about her chai tea latte. But it does seem like most people have something they use to kick start their morning. What about you? 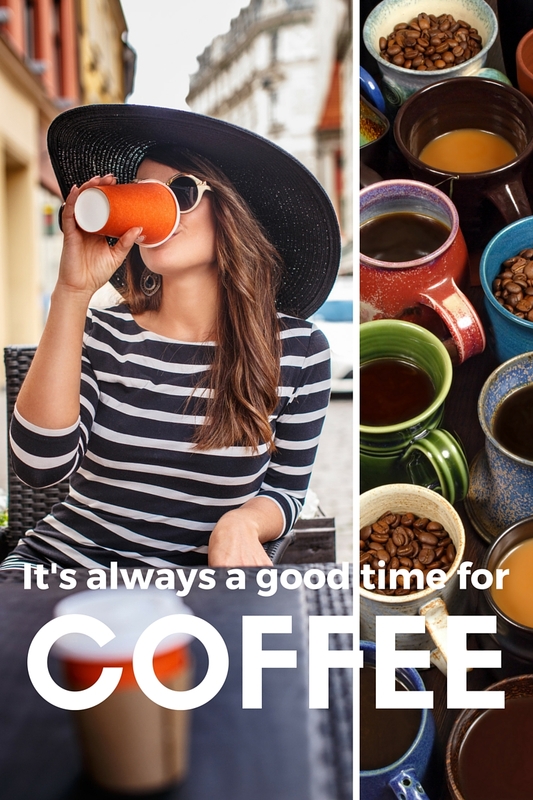 Do start the day with coffee or some other beverage? The Irish Setter and I had a lot in common and I don’t just mean hair color. Cork was a former show dog. I was a former Texas beauty queen. We were both named after places and we both had families with issues. My family drama would have to wait, but I thought I could assist with hers. “So, Carolina, what do you think? Is my girl depressed?” Spencer Hogsworth, Cork’s owner, bounded into the room. He ran a hand down the dog’s feathery chestnut fur and gave her a pat on the head before continuing around us to fling open the drapes. He said “top” with such emphasis you’d think I performed life-saving heart surgery, instead of performing sanity-saving dog and cat therapy. I’d had to start the day without coffee which isn’t a good thing for me, or for the people who are unfortunate enough to have to interact with me sans caffeine, but I was trying very hard to be patient. And Spencer Hogsworth, bless his heart, was certainly trying my patience. 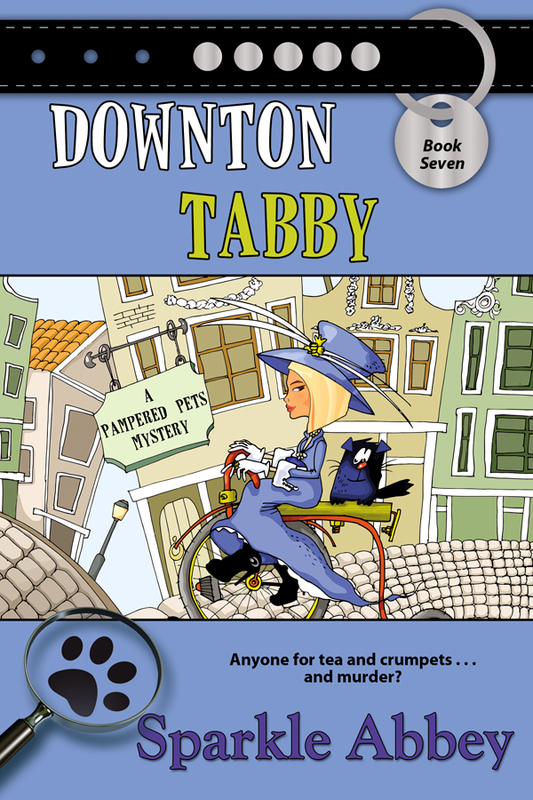 Sparkle Abbey is actually two people, Mary Lee Woods and Anita Carter, who write the national best-selling Pampered Pets mystery series. They are friends as well as neighbors so they often write at ML’s dining room table or at the Starbucks up the street. If they could write anywhere, you would find them on the beach with their laptops and, depending on the time of day, either an iced tea or a margarita. 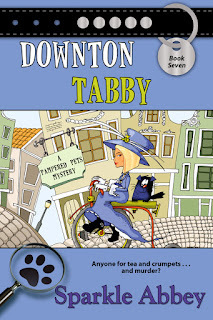 When their publisher, Bell Bridge Books, asked them to choose a pen name, they chose to use Sparkle Abbey because they liked the idea of combining the names of their two rescue pets which are pictured here. They love to hear from readers and would love to connect on Facebook, Twitter, and Goodreads. We're on the same page, Willow. I would become a killer character without my morning caffeine! Having it every morning has saved countless lives and I always have a back up in case my coffee pot breaks! LOL, Stephanie! Good plan having a back up. Coffee is the best in the morning! Yes! As far as a back up plan, I have a French Press for those times when the coffee maker might not be feeling up to par.